Twenty more innocent people were pepper-sprayed last week, although not by police cracking down on protesters this time, but by a woman fighting for a discounted Xbox at Walmart. This was only one of many violent incidents that marred Black Friday last week, as throngs of crazed consumers hit stores across the country to get the best deals of the year, on what turned out to be the biggest day of shopping ever. In an effort to push back against the frenzy of consumerism that overtakes our country every year at this time, Adbusters used the 20th annual Buy Nothing Day to kick off their latest campaign: #OCCUPYXMAS. Indeed, Bank Transfer Day earlier this month was a resounding success. According to a survey by the Credit Union National Association, in just the month preceding Bank Transfer Day, at least 650,000 people moved their money—totaling $4.5 billion in new deposits—to credit unions (as opposed to 80,000 new customers in a normal month), which inevitably underestimates the real impact of the campaign. 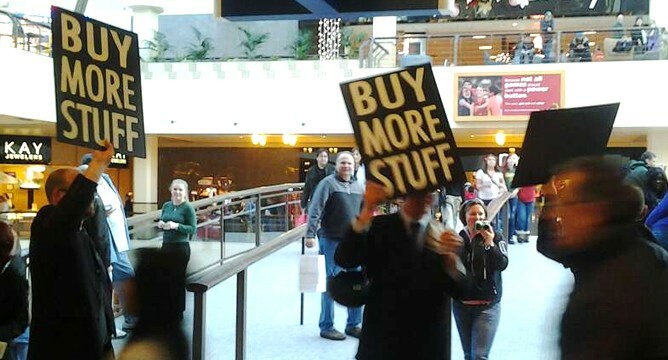 Occupy Christmas kicked off on Buy Nothing Day | Nonviolent Action Network.